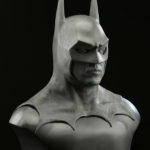 Custom display base and mannequin for a licensed Batman costume style motorcycle suit! 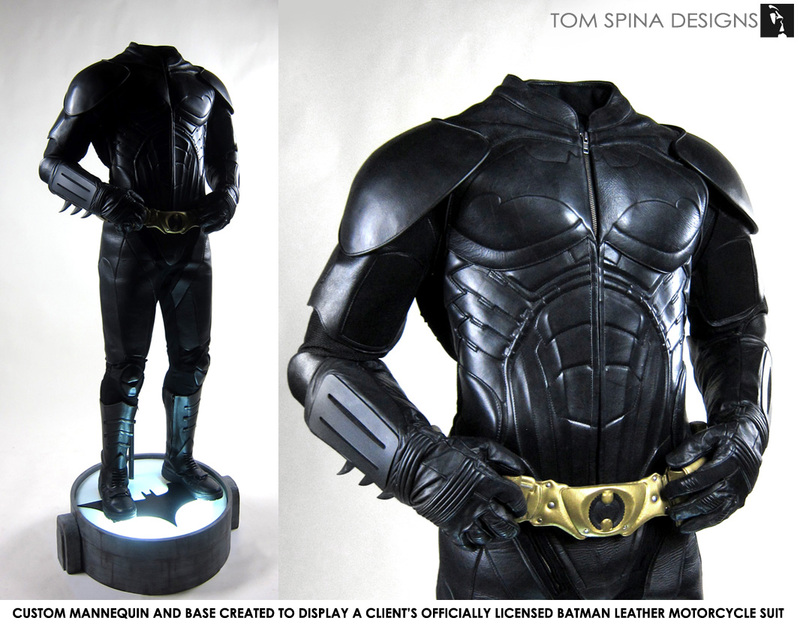 Our client came to us with their amazing Batman costume style motorcycle suit from our good friends at UD Replicas. David Pea and the folks over at UD Replicas specialize in screen accurate replica garments and are friends of Tom’s so we were all too excited to get the chance to create a display for one of the amazing Batman suits they created. 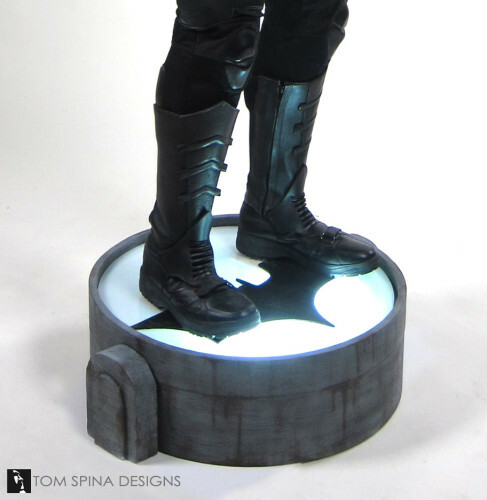 Our client wanted a themed display that would add a little pop and wow factor to the already cool leather suit based on the Batman Begins bat suits. 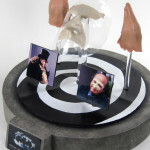 When trying to come up with a idea for a display we began by thinking of all of the things synonymous with the Batman character. One of the first words we came up with was bat-signal! We decided to create a display base that looked like the metal bat-signal used by Commissioner Gordon to summon the Caped Crusader. The base was made of wood which was theatrically painted to look like old rusty metal. 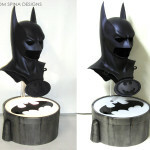 The base is topped with a sheet of heavy frosted plexi-glass which features the bat symbol. 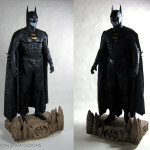 It is lit from underneath to give the look of the real bat-signal but also to cast an dramatic glow on the suit. 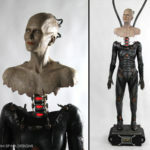 A pipe behind the figure attaches to the back of the custom mannequin, essentially “floating” the heavy body (and leather motorcycle suit) on the base, which will help keep its weight from possibly bowing the plexiglass over time. We chose a headless form to keep the focus on the amazing costume/motorcylce suit and a neutral pose that gives the display a museum-ish feel. Download and watch Batman Begins here!